It’s my turn on Sewing By Ti’s Color Me Lucky tour for March, and it’s a prompt that I really love! Make sure you check out the full tour listed at the bottom and see what everyone else is making. Modeled pictures here are thanks to the fabulously talented Marj Dee, taken at the Thousand Oaks Public Library. 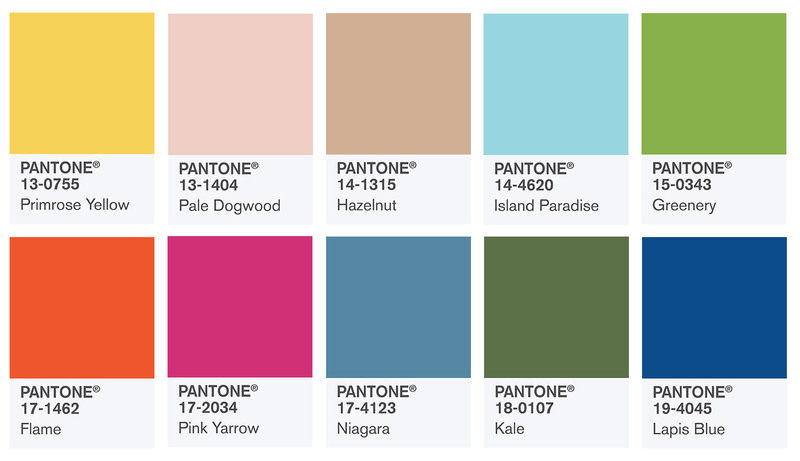 I follow Pantone’s seasonal color predictions pretty religiously. The Color of the Year is typically announced early to mid-December, and I always use that as the theme for Christmas stocking stuffers. This year, with Greenery, our stockings were loaded with green eyeliner, green tea facial masks, lip balm, soap, and lotion. I’m excited about Greenery for all of the reasons Pantone enumerated in their announcement – it’s an optimistic color, one of hope and growth. The full Spring palette has a joyful feel as well, and most of the colors will find a place in my wardrobe. Based on the work I did in my previous post, pale dogwood, hazelnut, greenery, kale, and lapis are my personal best matches. This is why I hoard fabric! I am making an effort to work through my stash (and even give quite a bit away this season), so I shopped my stock as soon as I committed to this tour. It turns out I’ve been ready for Spring 2017 since at least 2010 or so. 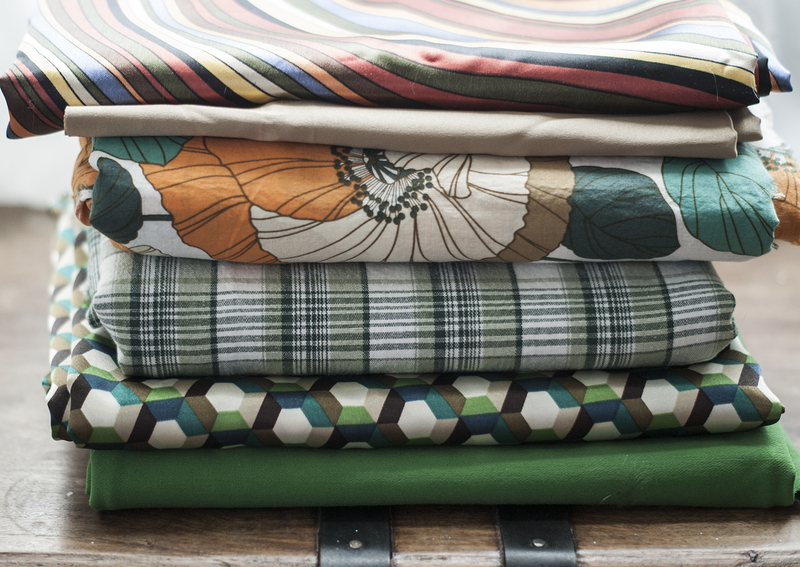 The oldest fabric I have here is the floral cotton lawn which I’ve had since 2008. The newest is the plaid and that’s at least 1 year old. Everything else falls in between somewhere, and I have a really great start for a nicely coordinated spring/ summer capsule. Just a couple of neutral solids and I’m all set! Here in Los Angeles we’ve had a gloriously wet winter (so long mega-drought!) which has brought out amazing desert super-blooms. The mountains are the greenest I’ve ever seen them and there are still baby trickles of water running through washes that are normally bone dry. We’ve started hitting 80°F highs during the day, so I wanted to make an outfit to match the environment here AND Celebrate Saint Patrick’s Day!! It’s a perfect day to sport some Greenery (I know, my green is not *quite* yellow enough), with just a hint of Lapis, Hazelnut, and Niagara. I revisted Wardrobe By Me’s Frida Shorts (affiliate link and first blogged here) with a slightly lowered rise and longer mid-thigh length. I still need to take another 3/4″ or so out of the front rise to take care of that crease. My fabric is a super stretchy cotton-poly blend Bengaline. The pockets are a fun stretch woven plaid. The single-fold bias tape (never the star of a garment) is from a roll I picked up at an estate sale for Edith Head’s chief pattern maker. She passed in 2015 and her home in Granada Hills was opened up for her estate sale. The line to get in was hours long and there were lots of hits and misses including dress forms, original patterns for Angela Lansbury in Murder She Wrote, and more thread than I’ve ever seen in my life. My mom happened to be in town and toughed it out with me! I have no idea how old this bias tape is, but I think it will serve me well. I love the pocket facing! My top is a simple pleated blouse by Burda, released in the September 2016 Lovely Illusion Collection. I fell in love with the entire collection when that month’s issue hit my mailbox and I’m proud of myself for actually making this (ugh to tracing and adding seam allowances). You can see I used the same muslin bias tape here for the bound neckline and armscyes. It might be because I though it would be fun for the inside of my shirt to match the inside of my shorts. I might have chosen it because the cotton will offer more stability than self-satin bias tape. OR it might be there because I was too lazy to make my own. One of those reasons is more true than the others – I’ll let you decide. I am pleased with my French seams at the shoulders and sides though, and it’s nice to not have any raw edges exposed, so no crazy satin fraying. I lengthened an inch beyond my added 1″ seam allowance, because I’ve found that European patterns always feel too short on me, even with my short torso. There aren’t any bust darts, so the shaping is minimal (but oh so comfortable and airy). I just love this outfit.